Being a city dweller, the night sky I usually see is just a black background with the occasional luminous dot. This is just a pathetic imitation of the way the sky is meant to look, but getting so see it the latter way takes some work. What is important here is to choose your level. If you have a motor-mounted telescope, you will have a lot more flexibility in your subjects than if all you have is a standard DSLR. Since I only have a DSLR, I'm limiting myself to simple stuff in this essay. You don't need a telescope for simple astrophotography. A DSLR or any other camera capable of long exposures is sufficient. Although one can use the self-timer on the camera, I'd recommend a cable or IR remote. It is near impossible to not shift the camera ever so slightly when you have to touch it, and Nikon's IR ML-L3 remote[a], for those of us with compatible Nikon cameras, is only $20 or so. For Canon users there's the RC 6 remote[b] - I'm sure there are cheap and small remotes for just about every DSLR out there. A tripod is also a must, as is a memory card that can hold a couple hundred of RAW-format shots - you'll be taking a lot of them. So much for the photographic equipment. One requirement for astrophotography is that you must get away from light pollution. This means getting away from civilization, which means that this is a little like camping except you don't get to sleep when it gets dark. It also means some physical discomfort unless you clothe yourself appropriately. You'll be standing still a lot, so bring a bit warmer clothes and shoes than you think you need. I would also recommend getting a dynamo flashlight - getting away from light pollution means getting away from any light source; this tends to make navigation on foot a bit harder unless you bring your own illumination. The dynamo flashlight isn't dependent on you having charged it, and will not run out of charge when you need it the most. Having packed up everything your next mission is to get away from light with the intensity of an old-skool vampire. With star trails: Make a single, long, exposure. Without star trails: Make several, shorter, exposures and use a shift-and-add technique to overlay them on each other to get a single long exposure. The first method is the simplest one. All you have to do is point your camera at something interesting, set the exposure time, and fire away. The second method is the one we will look into here. It involves splitting the single long exposure into several shorter exposures - short enough that the stars don't move appreciably during them - and then adding together the images produced in those. Since the stars will have moved relative to the camera over the course of these multiple exposures​, we have to rotate and move the shots so the stars coincide. Normally, I shoot in JPEG/Fine, but even if you, like me, shoot JPEG, switch your camera to RAW for this. Many parts of the image will be very faint, and the encoding noise will be on the same order of magnitude as the signal we're trying to capture. The goal here is to use the longest exposure we can that doesn't produce star trails. The easiest way to figure out what that is, is to set your camera at the focal length you want to shoot, crank the ISO up all the way to the top, and then keep increasing the shutter time until the trails appear. At ISO 3200, you should have no problem seeing the trails of bright stars, if any. Once you have your shutter speed, you need to calculate the total exposure time. I use anything from six to ten minutes, depending on the focal length. For shorter focal lengths, I use ten, for longer, six. The reason is the following: I don't move the camera between shots, so as I take my exposures, the region of interest moves across my field of view. Since I can only do image stacking in the region where all my shots overlap, that region shrinks as the number of shots go up. Furthermore, as the focal length increases, the rate of movement of the stars across my field of view goes up, so the region shrinks faster. A rule of thumb: Take more shots than you think you need. It is easy to throw shots away in the stacking phase of the workflow. This gives me a 16-bit TIFF file without any gamma or exposure correction. Opening one exposure in Photoshop. Even when reduced to 240x159 the noise is obvious - but the brightest stars can be seen. Save and close the .pto file. Open the .pto file in Hugin again, and verify that the control points are correct. The easiest way is to go to the control point editor and select the two last images. If the control points are still near stars in those two, the rest are probably OK as well. If not, you may have to select other stars. Optimize the panorama. You should have a maximum error of much less than a pixel. Done all that? Good! Now your images are aligned and ready to be remapped. First, select the projection and size you want. 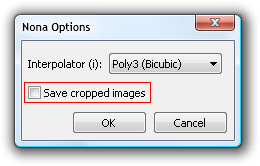 I use "rectilinear" and then let hugin decide the field of view and image size. Select HDR remapped output, disable "cropped images", and stich. You now have an image stack in image-stack.pfm. The image is in a 32-bit floating-point format, so you need to open it with a tool capable of handling such files. If you open the image stack output, you are probably very unimpressed with the result. That's ok. Astrophotography is a lot of art as well. The next part is to make that stacked image look good. Open the stack in Photoshop, and use the HDR tonemapping to get it down to 16 bit. I use "local adaptation" with a radius of 100 pixels and the default strength. Background noise can be removed by cloning the image layer and then applying a median blur with a high radius (about 30 pixels), followed by a 60-pixel Gaussian blur. This removes all stars from the image without leaving any bright smudges (the median filter does away with it). One can then use the original image layer to create a layer mask that is more transparent the brighter the pixel is. That way, the blurred image can be overlaid on top of the darkest (and noisiest) parts of the image, while leaving the stars and other interesting details untouched. The above method (median + Gaussian blur) can be used to get at the low-frequency imformation in the image​, which helps to mask off areas where you got stray light from any unwanted source. When you have fixed foreground objects, stack the un-transformed images as well. This gives you a fixed, non-blurred foreground, that you can incorporate into the final image. The final image stack: 68 MB PFM. The final, edited, image: 4 MB JPEG. Exif data from the first RAW shot: 1 kB XMP. The RAW images I throw away, unless there are special reasons for keeping them. Sort the images from first to last. 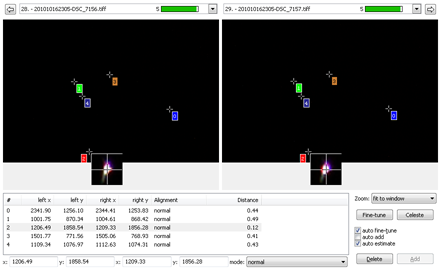 Set the positions of each star to the initial positions given by the user. Consider a square centered on the last known position of the star. The size of the square should be set so it is large enough to cover the movement of a star through two frames. That way, even if the star temporarily disappears in one frame, we'll catch it in the next. // relative to oldStarPosX, oldStarPosY. This center of brightness is the new position of the star. Output the old and new positions of the star. Update the star's position. The new position will be the last known position. 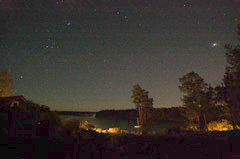 The stars move during the short exposures as well, but not enough to show a noticable trail. I'm really, really trying to get this into a distributable shape so you'll be able to use it, too. Getting any software product into a distributable shape, however, is a lot of work. That is, gradients that cover major parts of the image, such as atmospheric effects.